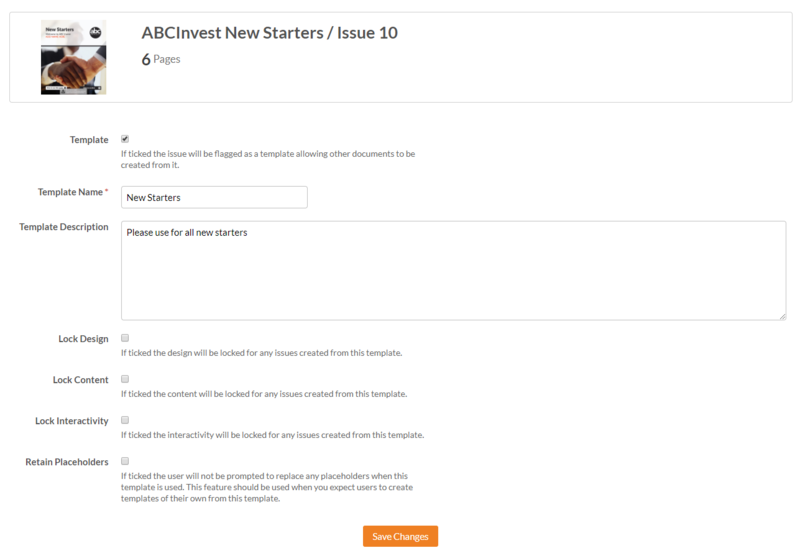 A template is a great way to save time if you create recurring publications, such as a newsletter or induction pack. To begin, create the issue that you would like to set as a template by selecting Create Issue from the homepage (or the Manage page for a publication). In your issue, layers and interactive modules can be locked to prevent them from being altered when the template is used. Select the Content tab to activate the design of your issue. To lock a layer, select a panel on your design, followed by the Layers palette. Select the padlock icon for the panel that you would like to lock. Two options are available so you can lock the Position and Settings of the layer and/or the Content of the layer. Select the Interactivity tab to activate the Interactivity of your issue. To lock an interactive module, select a module on your page, followed by the Interactivity palette. Select the padlock icon for the module that you would like to lock. As with the design of your issue, two options are available so you can lock the Position and Settings of the module and/or the Content of the module. Find out more about locking here. Select Manage for your issue. Select the Manage Issue drop-down list followed by Template Settings. Will appear on the create new screen under the thumbnail. If a name is not entered the publication/issue name will be used by default. We recommend using a clear and concise name such as Onboarding template so it is easy to find and use when you create an issue. A description of the template which can explain what it should be used for. For example - This template should be used for new employees during the onboarding process. If ticked, the design will be locked but the image and text content can still be changed. If ticked the content will be locked for any issues created from this template. If ticked the interactivity will be locked for any issues created from this template. If there are any placeholders in the design, the user will not be prompted to replace them if this is ticked. (To be used if you want to create a certificate template or a template that other admins will use to create another template).